More and more often I reflect on my day when the day's work is done, the children are in bed, and the gentle hum of the dishwasher seems to guide my thoughts, reflective and gentle, careffully sorting my day, pondering, learning, remembering. My days seems so long, though. Wednesday was a year. Thursday was a decade, and this week has been a century! 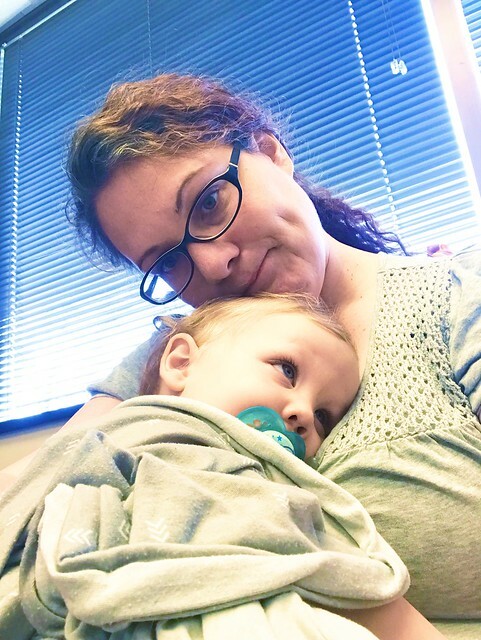 I had my prenatal visit on Wednesday. I am now 30 weeks along and still don't really feel pregnant. I do absolutely love feeling him moving, squirming, exploring hos his body works in there. He is healthy and perfect, although still breech. Typical. I, however, lost 3 lbs! I am so excited! That means total weight gain for this pregnancy so far is only 9 lbs!!! What a miracle this pregnancy has been. After my appointment I rushed to the store. The Sister missionaries were coming for dinner that night, and I had nothing on hand to give them. Also, a stove and oven that didn't work, so my options were very limited. But really, I just wanted to see Adrienne. She has been gone for what seems like a lifetime, although in reality was closer to a month. Or as she would tell it, two weeks. But I swear a month is more accurate. I am really sad that I haven't had a chance to just sit and chat with her. Every time I have met up with her since she has been home, has been a rushed ordeal. I planned to go to her house after Vince and J took their naps, but Beth and T were both on one that day. I told them if I heard of anymore hitting, I didn't care who did it, they would both have to take a nap! Of course, there was more hitting, and so there was nap taking. Which was actually a really good thing for me, because I had cooking and cleaning to get done! I started working in the kitchen. I had a schedule I would need to keep to if I wanted dinner ready before the missionaries came by. Except Vince had a different plan. He kept tugging on my skirt, and fussing, and he just wanted to be held. But the day was full of tender mercies all over the place. I let Vince help me cook a little bit. He measured out ingredients, and took great delight in spilling on the counter so he could play in it after the other ingredients were mixed. While he alternately played and fussed, I managed to get dinner going. I remember as a missionary it was rare that we got a real breakfast. There just wasn't the time for it. We basically had an hour to get ready and eat breakfast before it was time to study. And this included sharing bathroom time with a companion or two! So breakfast was almost always cold cereal. And so, because of that, I like to cook breakfast for the missionaries. Pancakes, hash browns, eggs, sausage, bacon, fruit, juice, etc. The whole nine yards. They were coming at 5. The syrup was ready by then. You have to understand. This isn't just any syrup. This is the very best syrup in the history of ever! Divine Syrup is the actual name for it, I believe. I found it one day while I was on pinterest, and when I really want to impress, I whip this baby out and have yet to have anyone be disappointed. Stir to mix. Syrup will foam up. Seriously, you need to make this in a pot bigger than you would think, and then add the baking soda and vanilla over the sink, because it will foam up and overflow if your pot isn't big enough. But seriously, Yum! By 5, only the syrup was ready. I had the bacon on the griddle, but that was basically it. I was a little panicky. But then I got a message from the Sisters. Their investigator had to suddenly move, and could they just come by and pick up the food later? That was Tender Mercy #1! I had a meeting that night at 7. It was going to work out perfectly. Missionaries at 5, my meeting at 7. I was nearly finished making dinner at 5:45 when it was brought to my attention that the meeting was actually at 6, not 7! However, the Sisters had asked if they could come over around 7. I went to my meeting, we got things squared away for our next RS activity, and then I got home. I started to wash the dishes, the Sisters came and went, and while I was cleaning up the kitchen, Vince came up the stairs to find me. He got half way through the dinning room and then he started to cry, and his progress was halted. I had no idea why! I walked around the corner and saw something out of the Three Stooges. Vince was standing in a puddle, struggling to stand up. Every time he got upright, a foot would slip out from beneath him and he would end up on all floors again. I had to laugh! I knew he was slip sliding in his own vomit, and that the poor kid was sick, but oh my goodness, it was a funny spectacle to watch him! My laughing was cut short 5 minutes later though. I scooped my little Stooge up, quickly, pulled his clothes off of him, and cleaned him off in the sink. I grabbed his blanket and binki, and then we went and cuddled on my reading chair. Where he promptly emptied the contents of his stomach all over me. I don't do vomit. I can clean pee, poo, spit up, and blood until the cows come home. I cannot clean up vomit. It causes a reaction in me, which just adds to the mess. It's terrible, really. Happily, Jeffrey came to the rescue. 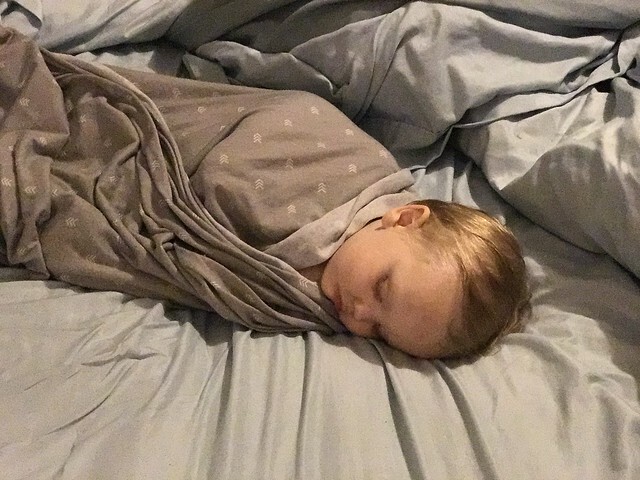 He took Vince and cleaned him up, we threw his blanket into the washer and got him a new one, I changed my clothes, we had family prayer, and then I took Vince to my room and rocked him to sleep, while holding a bowl to catch any more sick. And I did that all night long. Vince would get sick about every 45 minutes through the night. He developed a fever. I stayed awake literally all night long, sitting him up and catching throw up. Around 6 am the poor little dude added an explosive diaper to the mix. And continued to add them. All over my sheets. Around 10:00 I called his doctor. 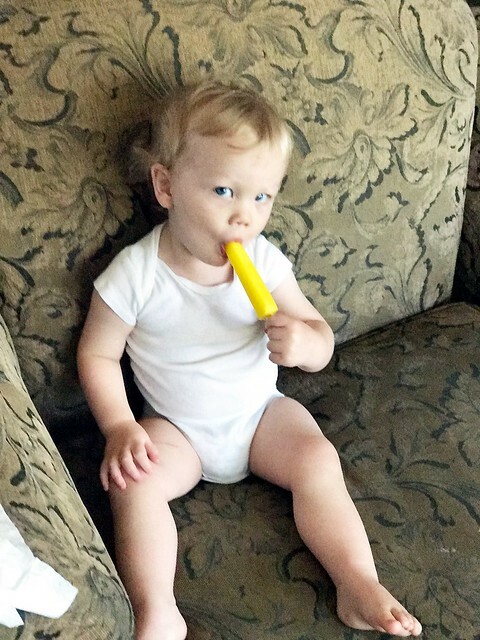 He hadn't been able to eat anything, and he had long since emptied the contents of his little tummy, dry heaving now, instead of actually expelling. They got me in right away. They were just as worried about him dehydrating as I was. The sweet ladies in reception gave me a throw up bag to hold for him while we waited to be called back. Just as I suspected, he has a gastrointestinal virus. I believe it is cryptosporidium, but they would have to test his poop to find out for sure, and it wouldn't really matter anyway. Because it is a virus. So, I get to keep him happy, clean, and hydrated. Keith, Faye, and Beth went to my mom's while I went to the doctor. She lives practically across the street, so it worked out well. They wanted to stay there, so I let them, and I took the tired boy home and let him sleep. I wanted to sleep, but couldn't. Too much adrenaline. He quit throwing up, and seemed to be fine that evening. We gave him some dinner, and Jeffrey was rocking him to sleep, and Vince got sick all over him. Again. I laughed at the justice of it all. And I was so happy it wasn't me who was covered in sick this time around! And while this should be a post completely on its own, I will touch on the highlights and elaborate tomorrow. My new oven arrived today! Bright and early, at 8:30 this am, I opened the door and two charming young men were standing there, a gleaming and winking stainless steel stove between them. Never had two strangers looked so handsome to me! They quickly installed it, going above and beyond, they took the old one away with them, and I was left, drooling over my new beauty! I mentioned to Keith that I need a new kettle. The kids had destroyed my old one. A smell that just wouldn't go away. He then suggested we visit go for a drive and visit Tai Pan to get a new one. He knows I love that store, and that they are closing, so everything is ridiculously cheap. Vince seemed to be doing alright. We hadn't had any mishaps, and he had slept through the night, so I decided it would be a nice outing. Of course, we invited Adrienne and kids to join us, because it might be sacrilege to go to that store without at least inviting her along! And so we met up. We didn't find a kettle, but I did find a good mixing bowl. I have been on the hunt for a deep one for a long time now. Half way through the store, though, and Vince began to wilt. His eyes glazed over, and he just wanted to be held. I knew then that it was nap time. It was decided that I need to make something really yummy with my brand new oven. Lunch Lady Brownies was the winner. 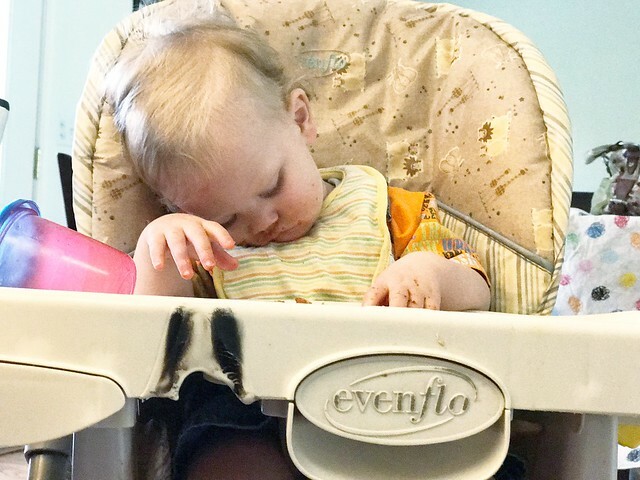 I fed the kids lunch, Vince fell asleep in his high chair for the first time ever. I felt really bad that he was that tired, but it made putting him to bed a snap! As I prepared to make the recipe, I learned I was out of eggs. So we had to put off until baby-man was awake so we could go to the store and get some eggs. Finally, we got the eggs. I turned on the oven to pre-heat it. Its maiden voyage. Its christening with chocolate. 5 minutes into it, and I noticed it was smoking. What a nasty and terrible habit to encounter on a first date! Sheesh. Whirlpool was not sending out good first impressions. I did a quick internet search and discovered that there is a protective oil or chemical in most new ovens and they need to be burned off. Yuck! So we turned on the self-clean button, and went out to eat as per the instructions of the internet. Seriously. It told us to go out to eat to avoid the smell and any smoke that might come from the oven. Nice! Whirlpool was redeeming itself. And there is where the fun really began.